Above, left to right: Chef Rob Nelson of Tusk & Trotter American Brasserie (left) and Chef Digby Stridiron (right). Trying delicious food is one of the perks of a ticket to the Roots Festival. Prosciutto on sourdough and a gorgeous heirloom tomato dish are only a couple of dishes visitors were able to sample last year. Below: Blind Boy Paxton strikes up a tune on the fiddle. 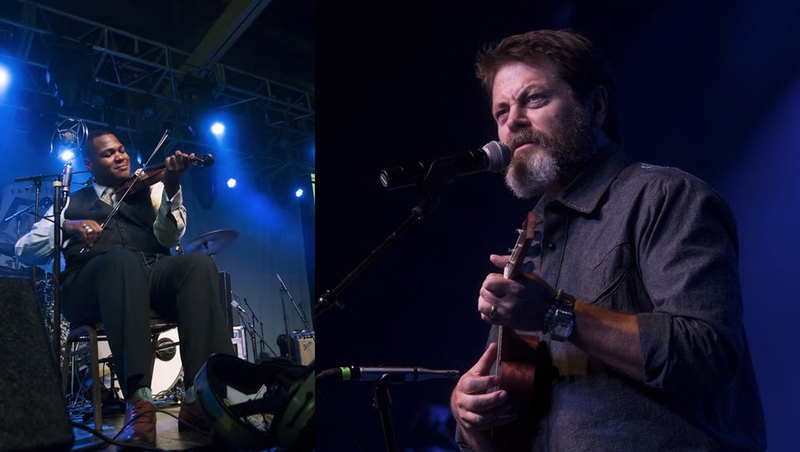 Nick Offerman plays the ukulele while he sings. Every hour of Fayetteville’s best kept secret is planned with “front end intention,” according to Jerrmy Gawthrop, the Fayetteville Roots Festival co-founder and co-producer. The festival’s infrastructure is built for maximum planning and minimal waste. Gawthrop, a chef, and his partner, Bryan Higbee, a musician, have been developing this successful enterprise since 2010. More than 35 staff in production-level management and hundreds of volunteers will pull off this year’s five-day music, food and live arts festival in Fayetteville and Bentonville. For months now, farmers have planned their harvest partially on the Festival’s massive need for meats and vegetables. Chefs have planned their Ozark-based menus, and musicians have set their playlists. Local and area businesses have contributed funds and resources, and festival organizers have collected solar energy for pre-loading into the grid. All of this is done with a spirit of doing what is best for all the participants and guests in a sustainable and mindful manner. “We want to use what is best for [farmers] to donate or sell to us and doesn’t hurt their margins,” says Gawthrop, so Roots’ organizers develop “serious relationships” with the farmers. Planning started last winter when they approached their Farmers of the Festival, a consistent group of area farmers. The pig farmers, for instance, are approached over the winter, so farmers have enough time to raise and slaughter the pigs according to the festival’s needs. With this planning, the chefs are fully supplied and farmers do not completely deplete their stock a month before the Festival. Write here…Left to right: Chef Pecko Zantilaveevan, Executive Chef at the Four Seasons Restaurant in New York City prepares a dish. Chef Justus Moll and Chef Darwin Beyer of Meiji Japanese Cuisine take a moment from a food demonstration to say hello to the camera. Festival organizers also work with Fayetteville’s and, as of this year, Bentonville’s farmers markets to manage and arrange for the substantial vegetable needs for the festival. “We will need, say, one hundred pounds of tomatoes and every cucumber they have,” says Gawthrop. They buy from the farmers everything they have an abundance of during August’s bounty. Last year, they spent $13,000. This year, they will spend twice that and will invest as much as $20,000 into local farms. Top to bottom: Chef Pecko Zantilaveevan, Executive Chef at the Four Seasons Restaurant in New York City prepares a dish. 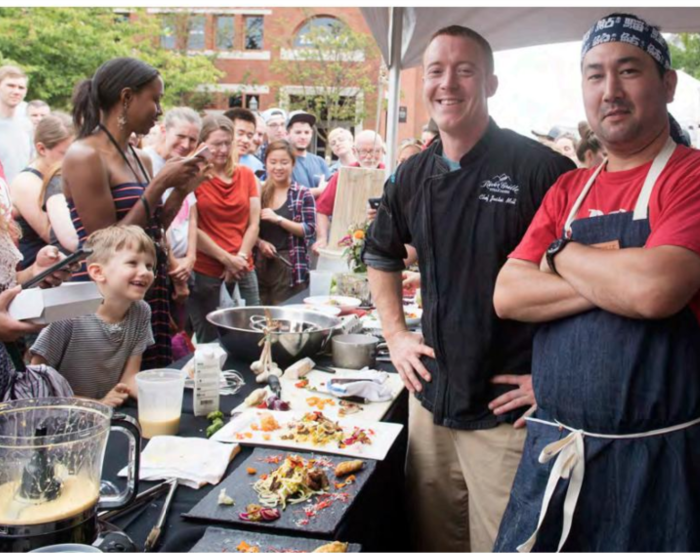 Chef Justus Moll and Chef Darwin Beyer of Meiji Japanese Cuisine take a moment from a food demonstration to say hello to the camera. Festival participants can choose among several dining venues featuring the bounty of the Ozarks and with a few exceptions, all dining will occur near live music performed by a wide selection of talented artists. This year, organizers have added a five-day culinary pass which allows participants to choose five events, or “slices.” On Wednesday night, the festival is kicked off at Fayetteville’s The Hive with a multi-course sit down meal followed by paired tastings and musical performances at The Record. Another event, on Thursday, is the Grand Tasting, which includes every guest chef. There, guests can sample mostly local foods from each tasting station paired with offerings from local breweries. On Friday and Saturday, the public may enjoy a low-cost masterclass series at Brightwater, northwest Arkansas’s culinary school, and events at local libraries. During Sunday’s final event, families can gather at Tricycle Farms for a grand ice cream social while listening to a ten-piece jazz and funk ensemble. Culinary passes and a full lineup of music and dining events are available at www.therootsfest.org.